A twelve-year-old gypsy girl has been hailed a genius after she scored a whopping 162 in an IQ test – making her smarter than EINSTEIN. 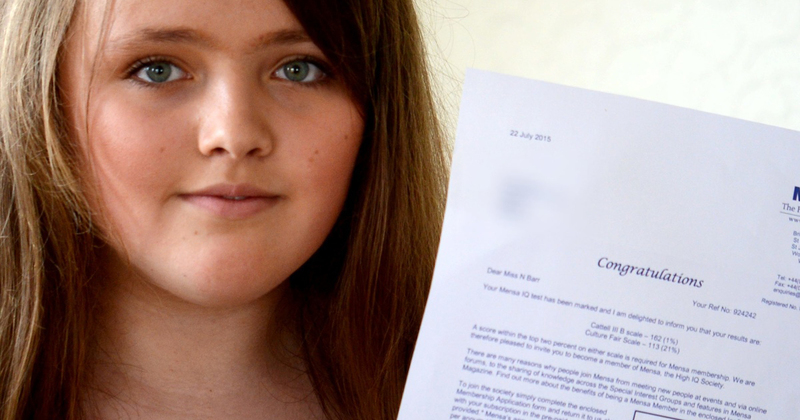 Nicole Barr achieved the maximum possible score for a youth giving her an IQ two points higher than scientists Albert Einstein and Professor Stephen Hawking. This puts Nicole, who is from the travelling community and lives in Harlow, Essex, in the top one percent of intelligent people in the world. Her dad James says her stunning achievement is ”the talk of the gypsy community”. The average adult IQ score is 100, whilst a score above 140 is considered to be that of a genius. 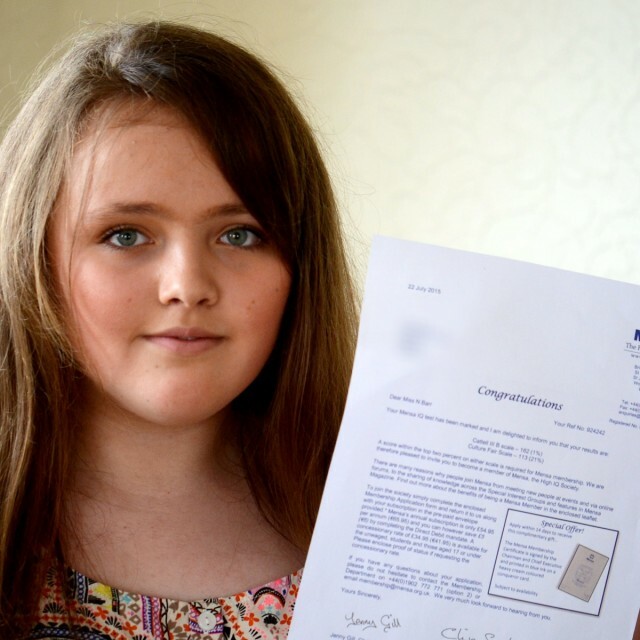 Nicole, who is in Year Seven, said: “When I found out I got such a high score, it was so unexpected. I was shocked. The schoolgirl, who attends Burnt Mill Academy, in Harlow, enjoys reading, singing and drama, and hopes to go on to study to become a doctor. Her dad James, a 36-year-old gutter cleaner and driveway repairman, is chuffed with the result she received on Thursday last week after taking the test five days previously. James, who is separated from Nicole’s mum 34-year-old Dolly Buckland, said: “The story has been going around the gypsy community, particularly on Facebook where it keeps being shared. Nicole lives with her three-month-old half-sister and her dad in a caravan. The talented genius attends drama classes and will soon be making an appearance in a performance of Shakespeare’s Twelfth Night. Helena Mills, head of the BMA group of six schools including Burnt Mill Academy, said: “Nicole is a brilliant pupil. She works incredibly hard and has thrown herself into many different activities in her first year with us. “For example she has been camping, entered writing competitions and taken part in a national maths challenge. There are 110,000 members of Mensa worldwide, including 20,000 in the British Isles. Only eight per cent of members are under 16, with only 35 percent of members being female. Mensa say that traits for high potential in children are outstanding memory, academically ahead of children of a same age, deep interest or knowledge in a subject, and preference of more mature company. Mensa Spokesman Ann Clarkson said: “Nicole’s IQ puts her comfortably within the top one percent of the population. “Only children can get a score higher than 161, because that is the maximum IQ score for an adult. The test is age adjusted for children.